As the spring season matures into 2017, the likelihood of damaging hailstorms is on the rise. Even if you do everything right, extensive hail damage can equate to costly roofing repairs. When disaster strikes, it’s important to locate and hire a top-notch roofing company for assistance. HCI Roofing and Construction is your source for the best roof repair in Louisville, providing quality services to Kentucky residents with a 100 percent satisfaction guarantee. While our roofing contractors are trained and experienced in diagnosing and repairing issues, we understand that most homeowners are not quite as confident in their abilities. Due to a number of factors, the damages your roof sustains during a hailstorm can vary wildly. Today, HCI will cover some of these varying factors and what the damage can look like based on your roofing material. Being able to properly identify hail damage as opposed to normal wear and tear can help to better plan for repairs or replacement. As always, it’s best to call a professional roofing company when you have any doubts. With your home’s roof, it’s always better to be safe than sorry! Hail size. 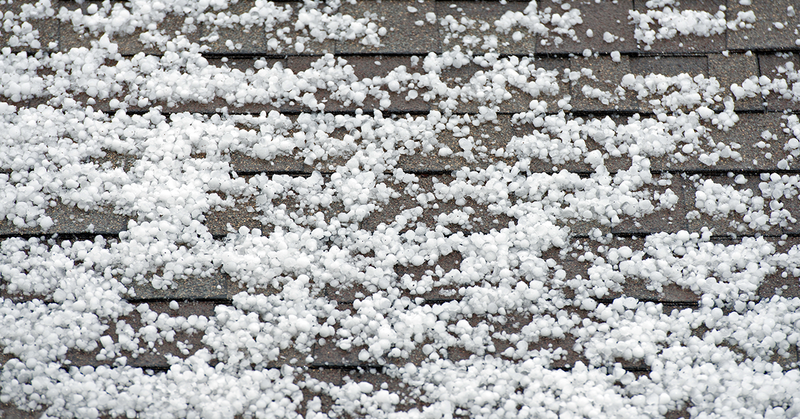 The easiest determining factor of damage is the size and density of the hail hitting your roofing system. From small pellets to softball-sized chunks, the damages sustained will rely heavily on how large the hail is that comes down from above. Even if your roof is new and costly, it may not be able to hold up to a densely-packed ball of ice! Roofing materials. The composition of your roofing, among other structures, will determine how much damage is done. If your roofing system is old and outdated, for example, its ability to protect against damages will be less when compared to a new roof. While some materials may take dents, others may split or fracture entirely. Wind. Gusts and wind direction both account for much of the damage done to property. Wind speeds, in particular, can increase the prevalence of dings and dents when all’s said and done. The direction of these gusts may also determine whether you’re sheltered from the worst of it or having to shovel your way out. Sheltering. The trees and neighboring residences in your area may help or hurt your home’s outcome after a hail storm has passed through. Landscaping and fencing can also play a role in how much hail hits your roof and how much of it is blocked. If a storm has made its way to your home, hail damages may soon be following. HCI recommends taking notes of the storm if you can in order to better assess the scope of damages that your home’s roof may have sustained. The storm’s duration, the wind direction and reported speeds, the size of the hail, and more can help to create a full picture of what happened. Being able to determine hail damages to your roof can help to prevent more costly repairs later and more effectively protect your home from future damages. 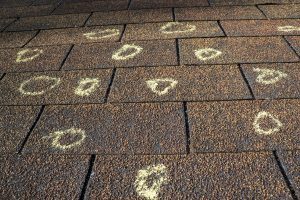 Next time, we’ll look at the different types of damages that can be sustained by different roofing materials and the basics of determining what is hail damage and what is pre-existing. If you believe that you’re in need of roof repairs for your Louisville home, feel free to contact us today for assistance!